Did you see this? 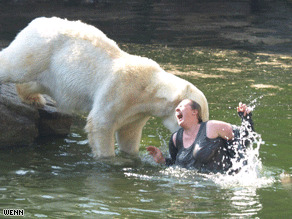 A woman in Berlin jumped into a polar bear habitat and got mauled. She survived only to realize that jumping into a polar bear habitat is a bad decision. I think I could watch the first 10 seconds of that clip over and over and over. The polar bears were probably hot enough without one more body in the water. I totally agree with everything everyone says on this clip. I just can't deal with this situation.